Green Fire Press, 9780986198021, 264pp. WILL YOU SETTLE FOR LEAVING HALF THE WORLD'S WEALTH ON THE TABLE? In a world where women's capital remains underused, angel investing--providing money, human capital, and expertise for start-up or early-stage companies--offers a potent opportunity for women to impact the future. 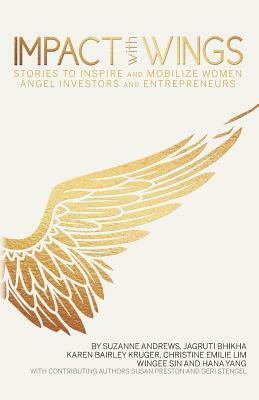 The authors--all seasoned players in the global business and investment community--share their personal stories and insiders' insights in a clarion wake-up call intended to activate new women angel investors. Both inspirational and actionable, Impact With Wings is a unique book offering the necessary tools and information for evaluating whether angel investing is an appropriate financial asset class for you. Whether you're a woman who wants to tap into your previously dormant financial clout or an entrepreneur--of any gender--who wants to understand the huge potential of women's economic influence, Impact With Wings will inform, educate, and inspire you. The six women who cofounded Wingpact believe that when women begin to apply their financial resources to projects they care about, a more just and equal world will be created. They wrote this book as the first step toward catalyzing change, pursuing their vision of a world in which everyone has the opportunity to successfully express their talents and realize their dreams. Though they come from diverse backgrounds, cultures, and phases in their lives--from a single career woman to a mother of four--they are united by their passion for empowering women and improving the global culture around investment.